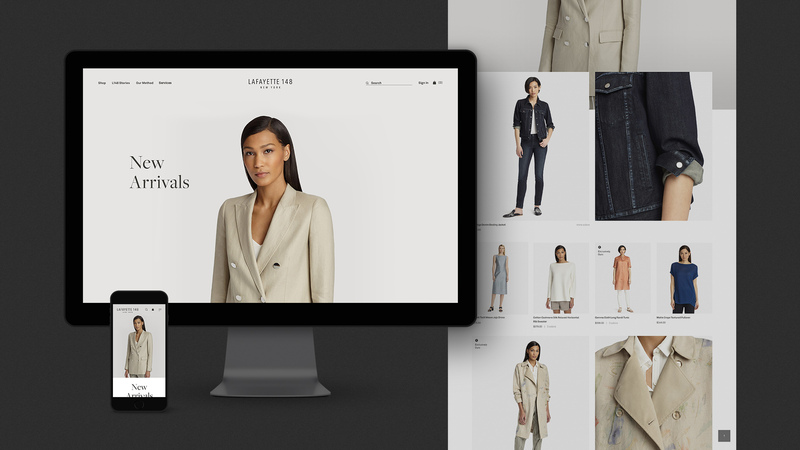 Building a new brand framework and ecommerce experience that reflects Lafayette 148’s roots in craftsmanship. How do you build a digital-first D2C channel that attracts a new consumer without alienating your core audience? Brand Positioning: Created “Art at Work”, a new brand positioning to talk about the production process in a more inspiring way and bring the shopper closer than ever to the product through designer commentary. Concierge-level service: The site now promotes the brand’s unique ability to deliver specialty orders and alterations to existing pieces. 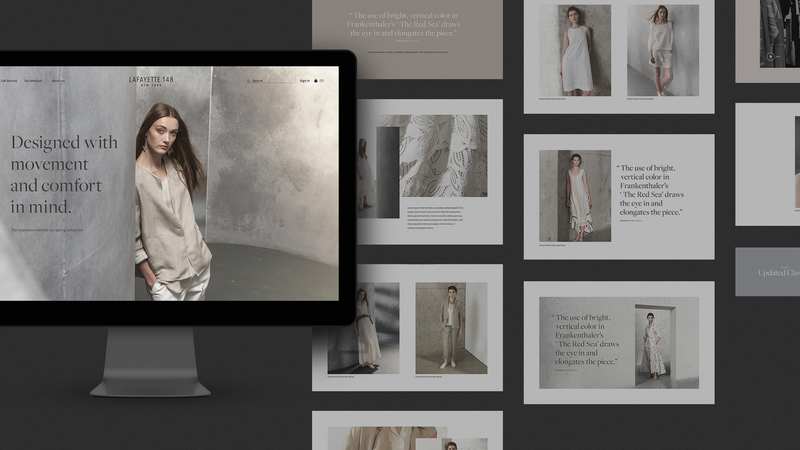 After 20 years in business, the new site represented an opportunity for L148 to gain back control of their brand story and create a new kind of customer experience, one that would act as destination for their consumer’s wardrobe and content needs—not merely a digital catalog. We armed the company with “Art at Work”, a new brand positioning that highlights L148’s differentiated production process in a way that brings the shopper closer than ever to the product and inside the design process. To create content that would resonate with existing customers—while helping new customers gain a deeper, richer understanding of Lafayette 148—we used the motif of “details” to show how “Art at Work” benefits her, how it inspires the brand, and how it comes to life in every aspect of Lafayette 148’s business. In our tone of voice, we thought a lot about the aspirational woman behind the company. In our initial interviews, the idea of empowerment, accomplishment and womanhood stood out. But probing deeper, we realized that this isn’t exactly right. The thing is, accomplished women know they are accomplished. They know they’re stylish. They don’t need to hear it from us. As a result, we created a tone to communicate that we understand her needs as a modern, accomplished woman in a way that’s authentic and realistic, not pandering or condescending. Our content introduces the brand’s product offerings as designed to accommodate the versatile, fast-paced lifestyle she leads. It also creates a deeper emotional connection with current customers, reinforcing their perceptions of the brand as one steeped in quality and a forward-looking perspective. Our design language was informed by the beautiful, clean lines of the brand’s garments and their fabrication and production process, which is the lifeblood of the business. The brand’s clothing is known for its architectural and sophisticated style, so the redesign removed the original product clutter and transactional layout, and committed to a more progressive, full-bleed presentation for all product photography and typography. The design aesthetic is more contemporary and less catalog-like, something intended to speak to a newer, younger audience that has different expectations for today’s ecomm players. Every page of the site is thoughtful in how it conveys digestible information, rather than bombarding shoppers with content. It’s transparent in highlighting the fabrication process and product details, which often involve a messy, creative process in order to get to something perfect at the end. It’s also purposeful in how it deliberately places and sizes each design element. Last, but not least, the digital flagship is human-led, as we considered our users’ needs first and business objectives second. These needs, uncovered in our research, are focused around having key touchpoints like the homepage and PDP functioning as content and inspiration hubs. Finally, we streamlined the navigation and simplified the cart check out. We also wanted to translate the brand’s unique concierge services, offered in their physical stores, to the digital realm. As a result, the site now promotes the brand’s ability to deliver specialty orders and alterations to existing pieces. Want a blouse in a color that’s not featured? Need to change the cuff on a sleeve? No problem. Instead of presenting product recommendations in a standard row, the site also features a curated, arranged wardrobe selection, which is more similar to the personalized styling advice a shopper would receive in-store. 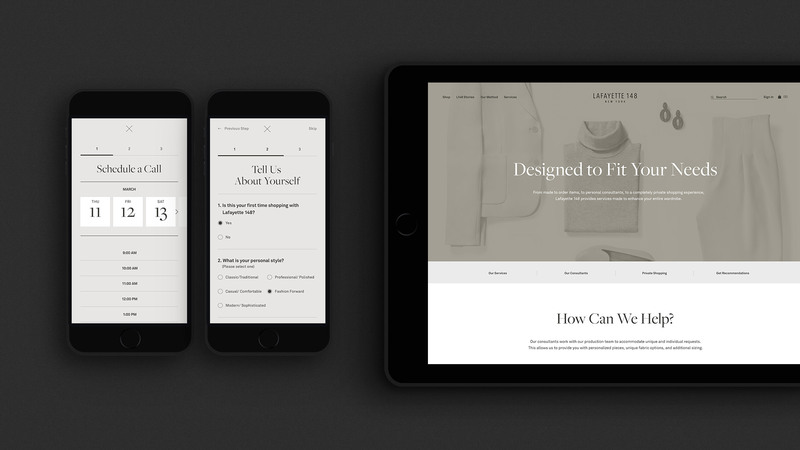 We armed Lafayette 148 with a differentiated brand framework and ecommerce experience that reflects the company’s roots in craftsmanship with a nod to fit, functionality and design. The site engages our target audience and speaks to her lifestyle while making her shopping experience frictionless.